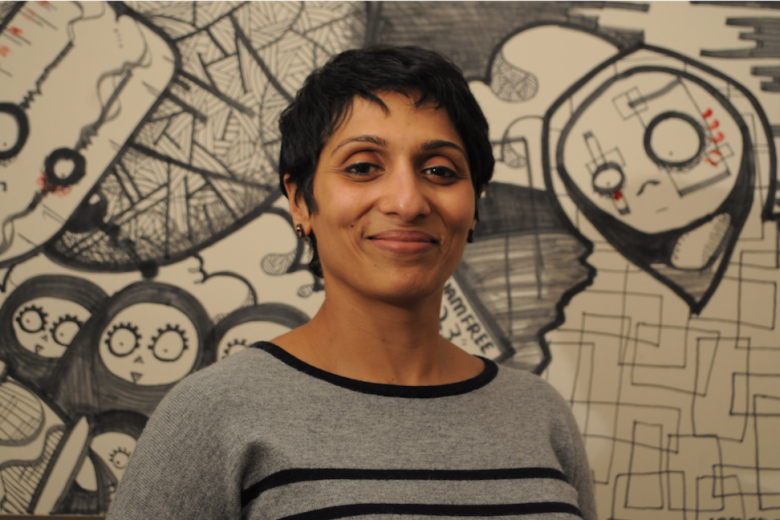 After watching the PR industry change as a reaction to the decline of publications and increase in free online content, Anu Ramani launched her own marketing business, Isoline Communications, specialising in savvy storytelling for tech and B2B brands. I have covered the gamut of marketing really. I started off selling watches in rural India, then entered the advertising space in India and then Singapore. I moved into PR in Hong Kong where I worked for more than a decade, then I took a break to volunteer with an NGO in Africa for a couple of years, helping worker rights by educating and training SMEs. I then went back to PR in London and I finally started my content marketing agency about three years ago now. When I held my daughter in my arms and she looked at me in that first minute, my career – which until then had taken first place – found itself coming ‘joint first’ with being a mother, not just in the early years but later as well. I was unwilling to give up a rewarding job that I was good at, to become a full-time mum, even for a few years. I decided to try working part-time, using childcare when I was away. And I was lucky enough to have a supportive boss, husband and most importantly colleagues, who helped me make it all work. Where did the idea for Isoline Communications come from? PR as an industry, particularly B2B tech where I specialised, had been changing steadily. We were finding journalists and publications gradually disappearing, falling victim to lower advertising revenues and the relentless growth of free online content. Towards the end, we were spending most of our time creating content that publications might or might not end up using almost verbatim. And clients’ technologies were becoming ever more complex and fast-changing. I thought that clear, lucid content would become one of the biggest needs for tech B2B marketers in the coming years. Eventually, I took the plunge into entrepreneurship. How did you move from idea to actual business product? A lot of the ideation and thinking was on the basis of conversations with colleagues, clients and journalists who were watching the industry grow and evolve. As a service, it was relatively easy to set up the company, but the more challenging task was to define the scope of service and a business model. My approach was very much trial and error: it took about nine months before I finally worked out the cope of service and the company as it is today was launched. I was once again very lucky to have clients, colleagues and contacts who put their trust in my skills and services and helped us get on our way. Savvy storytelling for tech and B2B brands. Our USP is very much our deep roots in the sector, which enables us to become deeply engrained into a client’s technology and a partnership approach which means we get deeply entrenched into clients’ products and services. Savvy marketers of B2B brands, particularly in technology and infrastructural sectors anywhere in the world. Word of mouth is extremely important and has been very effective for us. We have been quite successful with referrals, recommendations and returning clients. Most marketers conduct more than 50–60% of their searches online before even engaging with an agency. We emphasise SEO and social marketing strongly. Networking with industry peers and associations is another important aspect of our marketing strategy. It’s hard work but essential. Personalised outreach via e-mail as well as snail mail, followed up judiciously. Fear and self-doubt, when starting the business. I am inherently extremely cautious so perhaps this makes me reach lower than I potentially could achieve. I keep this in mind all the time and try to balance caution with appropriate risk-taking. It’s an ongoing challenge though! Every client win is a proud moment but another standout moment was when our campaign delivered unprecedented levels of sales leads for a client. To me, it’s a matter of self-identity. My work defines who I am as well as the contribution I make to our family and society at large; it keeps me interested in and curious about the world and people around me; and keeps me financially independent. My childhood hero was my dad – an honest, hardworking and upright policeman, who totally believed in giving his best to society. His work ethic inspires and drives me to this day. My first boss, who told me that complaining about clients was not something a good account servicing person ever did; instead, putting oneself into clients’ shoes would serve me much better. My MD in Hong Kong, a PR genius called Anne Forrest whose brilliant strategic mind, fearless nurturing attitude, maxims and advice I miss and recall every single day. I aspire to be like her. How do you balance your business/ venture/ career with your family? A supportive, understanding family is an important catalyst for entrepreneurship success, in my opinion. When I started the company my partner and children were – and still are – my number one cheerleaders. From stuffing envelopes to filing, they have helped me in innumerable ways. However, it isn’t easy and there have been sacrifices aplenty on all fronts: networking evenings I have foregone, concerts I have missed, parents’ consultations I have forgotten, not to mention countless late nights when I worked after the kids had gone to bed… it’s hard work – of course it is – and you need to become very organised, efficient and good at compartmentalising. What are your four top pieces of advice for someone wanting to do something similar? This takes the pressure off your decision. Once you’ve taken the plunge, trust me, you will often know instinctively what needs to be done today, and tomorrow, and the day after. And then you can start thinking bigger. When you’re starting off, your reputation and the habits you establish become the norm for your company. So always, always strive to be the very best you can be at your business – whether you’re launching an app, or writing content, or bringing a physical product to market. Put in the hours, and don’t be afraid to push your employees, partners and suppliers to achieve the standards that you expect. If you’re like me and are starting on your own, in a country half a world away from where you were born, you’re going to need help. Ask people for it! I have been constantly amazed at how many people are more than happy to give you their time, expertise and the benefit of their experience. An hour with someone in my ‘support group’ is a rich source of inspiration, action points, ideas and more. Life as an entrepreneur is full of disappointments, and you just have to take it on the chin and carry on. So, practice being kind. To yourself, if you haven’t achieved what you were hoping to, or lost that pitch you were really confident about. At the same time, remember that everyone is fighting a hard battle – remember to be kind in your words and actions. You’ll be surprised how many people appreciate and remember even the smallest acts and words of kindness. It all adds up to good karma in the long run, so practice it. You can find out more about Isoline Communications on their website.